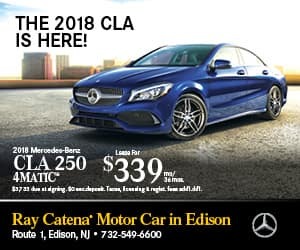 THE 2018 CLA IS HERE! Pricing incl. all costs to be paid by a consumer except for taxes, title, licensing, regist. fees, insurance, dealer prep. & add’l options. MSRP: $37,495. Due at signing: $339 1st mo. pymt, $2599 cap cost reduction, $795 acquisition fee. Lessee resp. for maint. & excess wear & tear. Offer incl. 30,000 mi. w/excess @ 25¢ per mi. Ttl pymt/ttl cost/purchase opt: $12,204/$15,598/$22,122. To qual. buyers w/approved credit thru MBFS. Details @ 1-800-f-o-r-Mercedes. Offer expires 01/02/2018. Pricing incl. all costs to be paid by a consumer except for taxes, title, licensing, regist. fees, insurance, dealer prep. & add’l options. 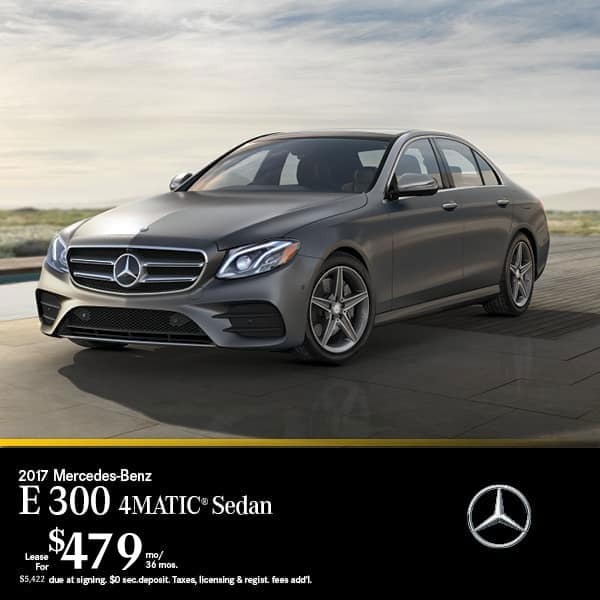 MSRP: $43,725. Due at signing: $339 1st mo. pymt, $3149 cap cost reduction, $795 acquisition fee. Lessee resp. for maint. & excess wear & tear. Offer incl. 30,000 mi. w/excess @ 25¢ per mi. Ttl pymt/ttl cost/purchase opt: $12,204/$16,148/$26,672. To qual. buyers w/approved credit thru MBFS. Details @ 1-800-f-o-r-Mercedes. Offer expires 01/02/2018. Pricing incl. all costs to be paid by a consumer except except for licensing costs, registration fees & taxes. 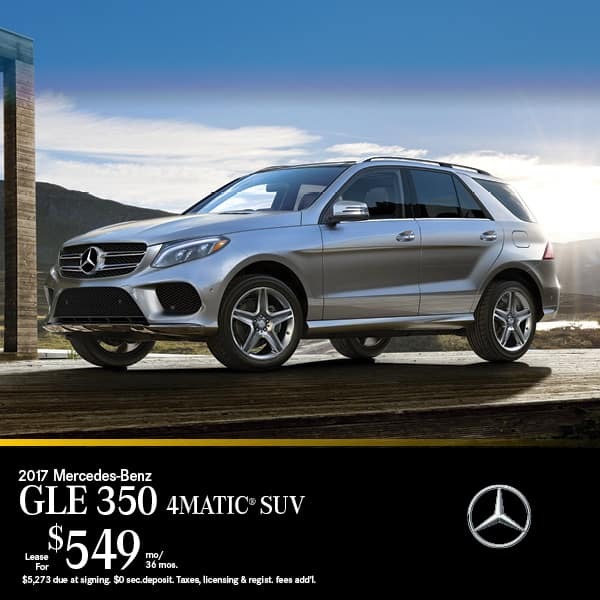 MSRP: $55,575. Due at signing: 1st mo pymt, $3,649 down pymt, $795 bank fee & $499 DOC. Lessee resp. for maint. & excess wear & tear. Offer incl. 30,000 mi. w/excess @ 25¢ per mi. Ttl pymt/ttl cost/purchase opt: $17,244/$22,187/$32,789. To qual. buyers w/approved credit thru MBFS. Details @ 1-800-f-o-r-Mercedes. Offer expires 01/02/2018. Pricing incl. all costs to be paid by a consumer except for taxes, title, licensing, regist. fees, insurance, dealer prep. & add’l options. 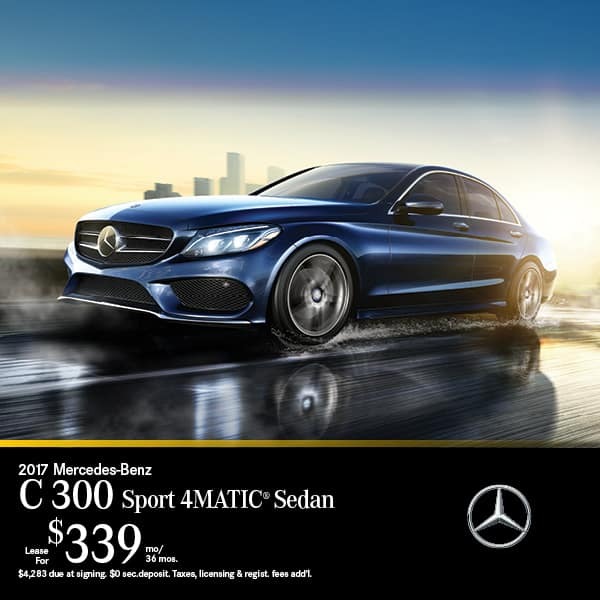 MSRP: $59,325. Due at signing: $549 1st mo. pymt, $3929 cap cost reduction, $795 acquisition fee. Lessee resp. for maint. & excess wear & tear. Offer incl. 30,000 mi. w/excess @ 25¢ per mi. Ttl pymt/ttl cost/purchase opt: $19,764/$24,488/$32,629. To qual. buyers w/approved credit thru MBFS. Details @ 1-800-f-o-r-Mercedes. Offer expires 01/02/2018.